The EZ-Shower is designed to be used where a water source is unavailable, it is an overhead bedside shower that can either hang on a bedpost or an I.V. pole. It is capable of holding 2½ gallons of warm tap water – ample enough for a complete shampoo and rinse. 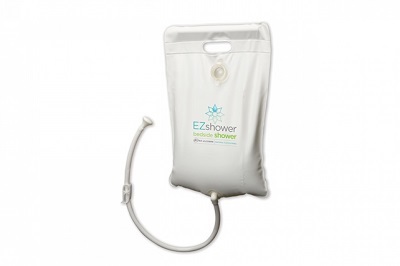 The EZ-Shower is made of heavy-duty latex free vinyl and comes with a 1-year limited warranty. The EZ-Shower holds up to 2½ gallons of warm tap water - ample enough for a complete shampoo and rinse. The EZ-Shower's flexible hose directs a gentle stream of water exactly where it's needed. The 2' hose also features an on/off switch to control water flow.